In a remarkable feat of perseverance and beauty, Durban’s Flatfoot Dance Company celebrates its 16th anniversary with a new dance theatre work, Under the Same Sky, at the Elizabeth Sneddon Theatre from April 24 to 28, 2019. With an international touring reputation for excellence and a host of national awards under its belt, Flatfoot’s arrival at this momentous 16th year mark as one of South Africa leading contemporary dance companies, is a testament to a dedicated team of dancers and administrators. 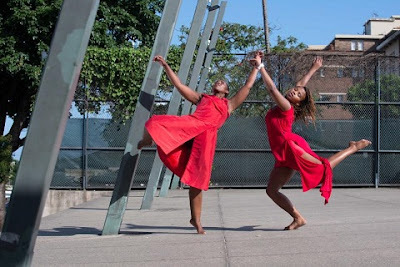 In keeping with its reputation of creating and performing edgy, controversial, beautiful and intelligent dance, Flatfoot dives heart first into the zeitgeist of contemporary South African identity, in Under the Same Sky and “asks us to remember our humanity and the place that art holds in teaching resilience”. Three new dance works by Sifiso Khumalo, Jabu Siphika and Lliane Loots will premiere in this season. Sifiso Khumalo’s work Ngaphesheya (loosely translated to mean ‘beyond’ or ‘over there’) is a personal journey back to Khumalo’s own childhood in Clermont growing up with the scourge of “necklacing” as a political weapon. In this piece, made from a questioning and very present perspective in 2019, asks where we are going if our history (and where we come from) means nothing. Jabu Siphika’s growing feminist voice as a choreographer, opens up in her latest work titled Death of a Dream. Working from the personal to the political, Siphika has created an evocative duet that looks at disintegrated personal relationships as a metaphor for disinterred political hopes and dreams. Beautifully danced by Siphika herself in partnership with Mthoko Mkhwanazi, Death of a Dream is heart-breaking in its beauty. Lliane Loots’ unsheltered, ends the programme. Loots’ award-winning style that combines video, spoken word and dance in a “total theatre”’ experience, finds its artistic legs in her newest work. unsheltered moves Loots and Flatfoot’s quest for humanity into the global domain and starts to “unbuild” the meaning of the walls that are the prevailing political agendas of many first world nations. It asks the audience to journey with the dancers into the heart of difference and what it means to embrace a hurt, damaged and vulnerable humanity. Loots’ dance work has a poetic depth that will provoke and delight audiences. Dancing in the season are Sifiso Khumalo, Jabu Siphika, Zinhle Nzama, Sbonga Ndlovu, Ndumiso Dube, Siseko Duba, and Mthoko Mkhwanazi. Lighting design is by Wesley Maherry.